English Language Courses in London? A lot of clients and compatriots in general often ask me where they can go to English language courses in London. They are keen to improve their English. I am on the principle that when a person needs service, it is best to turn to a professional rather than trying to be a master of everything. So I can concentrate and develop in directions that I am attracted to and in which I can achieve good results. Regarding English courses – it was very important to find language schools and teachers that I should recommend. I wanted to make sure that people would be happy and would not do a bearish service. Looking for English lessons, many compatriots immediately think of free or online (and if both) English courses. But there is no such a thing as” free lunch”. From time to time, there are advertisements and places that are supposed to offer “freaks” (it is deliberately written freaks to not index the “free” English language courses in London, but people, who have visited them, have told me that no one does pay attention to them and learn nothing. You have to remember that time in the UK is money and nothing is free – so that a teacher can teach his students free of charge, someone else will have to pay for the time, the hall, the electricity and the school materials. This country has no problems with the distribution of English language and does not give extra money for immigrants to learn a language. Maybe some church or college might offer open courses in English, but again, we rely on the quality of teaching and whether you will learn something or you will waste your time (and money because time is money here, even when something is free). 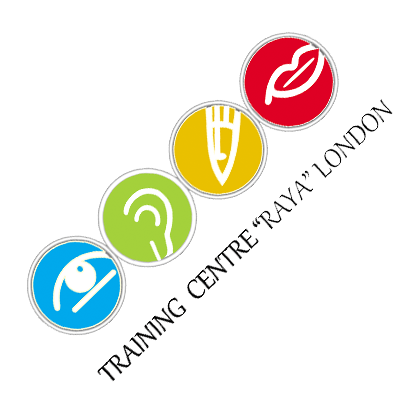 I spoke to friends and acquaintances, and two of them mentioned Raya London training center as they shared that they were happy. I contacted the company, presented myself and told them what I was looking for – they were very polite and kind. During my conversation with George (the person for contact I was speaking with) we came to the conclusion that it would be best for me to judge personally how they teach, what their course is and whether it is for me. So we agreed to go and attend a two-hour lesson. It was not easy to find free time, but in a few days I went to their office in East London one night and spent 2 hours listening and even participating in one of their English lessons. There were 10 compatriots in the classroom, most of them came straight after work. Everyone had written their homework, they had textbooks, and on a massive table they took part in the English lesson led by Sofia Aneva. I was also fascinated by the students’ diligence – some of them were not easy, but they did not give up. Usually when a person pays for something, he feels more engaged in it, he gives his money for lessons, and it is in his interest to get the most out of this training. To admit honestly I was very pleasantly enthused both by the classroom and the teaching materials, but mostly by the teacher. I really enjoyed the English language course and I think it’s worth a person to enroll on it, especially when you need English every day.With a good advice, I can recommend Sofia Aneva and Raya London training center to anyone who asks me where in London I can study English in a friendly atomosphere without feeling shame or inconvenience.